The MAJOR CONNECTOR is that part of a remvable partial denture (RPD) that joins the component parts on one side of the arch to those on the opposite side. It is the unit of the RPD to which all other parts are directly or indirectly attached. 1. Join the various parts of a RPD so that the prosthesis acts as a single unit. A major connector must be rigid so that the component parts do not function independently form one another. This way, forces applied to one part of the RPD are transmitted to other parts and are dissipated by all teeth and tissues contacted, rather than just by those where the force is applied. 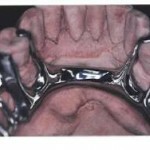 Mandibular major connectors are usually located on the lingual surface of the ridge and teeth. Rarely, mandibular major connectors are located on the labial alveolar ridge area or under the anterior part of the tongue. Major connectors are shaped as bars and straps or plates. A BAR-SHAPED major connector is long, narrow, and thick. In cross section bars are ½ round, ½ oval or ½ pear in shape. The thickness of a bar should be at least 6 gauge (4.11 mm) at its greatest dimension. The minimum width of a bar is 4 mm, but they must usually be wider than this for adequate rigidity. A STRAP or PLATE-SHAPED major connector is long, wide and thin. The width of a strap or plate varies from 6 – 8 mm to the entire length of the palate. The thickest portion of straps or plates is 22 – 24 gauge (0.64-0.51 mm). 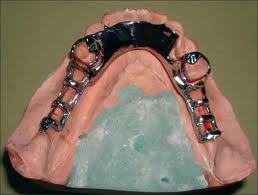 Frequently a strap or plate is added to a bar extending the major connector onto the tooth surfaces. This is sometimes called an APRON. There are six mandibular major connectors described in the literature: lingual bar, lingual plate, lingual bar with a continuous bar indirect retainer, labial bar (or plate), cingulum bar and sublingual bar. Of these, the lingual bar and lingual plate are used very frequently. 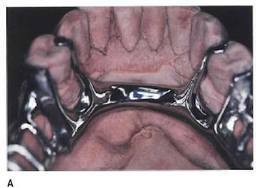 The other mandibular major connectors are seldom indicated, or are advocated by few practitioners. 1. 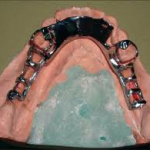 The lingual bar is the mandibular major connector of choice if sufficient bracing and indirect retention can be provided by clasps and indirect retainers; and if future additions of prosthetic teeth to the framework to replace extracted natural teeth are not anticipated. 2. Diastemas or open cervical embrasures of anterior teeth. 1. Less than 8 mm between the marginal gingiva and the activated lingual frenum and floor of the mouth. 2. Only a few remaining anterior teeth which must be contacted to provide a reference for fitting the framework and indirect retention. 4. An undercut lingual alveolar ridge which would result in an excessive space between the bar and the mucosa. 5. A parallel or sloped anterior lingual alveolar contour in a distal extension RPD where the bar may rotate into the tissues as the denture base moves toward the residual ridge. 1. Covers a minimum of surface area of teeth and tissues therefore the potential for caries, periodontal problems and mucositis caused by plaque being held in contact with teeth and tissues is minimal. 2. Patients prefer lingual bar to lingual plate, probably because it is relatively small, inconspicuously located and minimally interferes with function. 1. 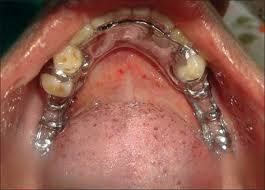 Not as rigid as the lingual plate, sublingual bar or lingual bar with continuous bar indirect retainer. 2. Difficult to add additional prosthetic teeth to framework. 3. Framework goes from thick (at the minor connectors) to thin (at the bar) to thick again which is metallurgically and structurally complicated. The result may be weak areas in the casting with the potential to fracture. SYNONYMS: LINGUOPLATE, LINGUAL APRON, CLOSED KENNEDY MAJOR CONNECTOR. 1. Less than 8 mm between the marginal gingiva and the activated lingual frenum and of the mouth. 3. Undercut or parallel lingual alveolar ridge when the superior edge of a lingual bar cannot be located in close contact with the mucosa and still be at least 3 mm inferior to the marginal gingiva. 4. Distal extension RPDs with parallel or sloped lingual alveolar ridges where a lingual bar would rotate into the ridge when the base area rotates tissueward. 5. Mandibular tori or exostosis which must be covered by the RPD because they cannot be surgically removed or avoided in the RPD design. Relief is provided between the torus or exostosis and the framework. 1. A lingual bar may be used. 2. Overlapped anterior teeth where the undercuts in the area of the superior edge of the plate cannot be removed. Frequently this criteria cannot be met and a lingual plate which will have small gaps between the superior edge of the plate and the teeth must be used. 4. Diastemas, unless the lingual plate can have slots in it to avoid the display of metal. 5. Open cervical embrasures where the plate would be visible. 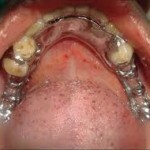 A lingual bar with continuous bar indirect retainer or a labial bar should be considered. 1. More rigid than a lingual bar. 2. Metallurgically and structurally simple. 3. Easy to add additional prosthetic teeth to framework. 4. May prevent supraerruption of the teeth it contacts. 1. Covers more tooth and tissue surface than lingual bar. 2. May be more noticeable to patient than lingual bar. 3. May cause flaring of incisors if it contacts their cingula as the base area rotates tissueward. This entry was posted in Denture and tagged cervical embrasures, clasp, diastema, floor of the mouth, framework, indirect retainers, labial alveolar ridge, lingual bar, lingual frenum, lingual plate, mandibular major connectors, prosthesis, RPD, tongue on June 20, 2012 by chzechze.